I love having a mirror in my shower, it's just one of those things that makes life a little bit easier. 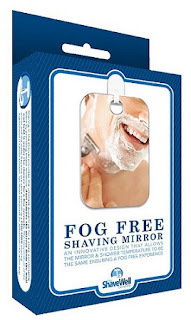 So when I was contacted to review the Fog Free Shaving Mirror from ShaveWell, I was more than happy to oblige. Not all Fog-free shower mirrors are created equal, apparently there are quite a few lemons. 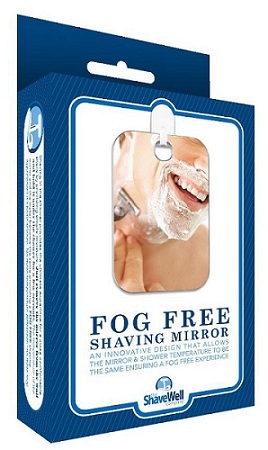 The originator of ShaveWell recognized there needed to be a solid solution to the many foibles associated with the typical fog-free mirror. The result was a product that delivers a fog free, quality reflection without the fuss or muss. I noticed the ShaveWell is rated highly on Amazon, men everywhere appear to be singing its praises. Men, you may want to start shaving in the shower! Shaving in the shower is more than just convenient. The moisture from the shower makes it possible to produce a more comfortable as well as closer shave. Of course this is not just for men. I now have two mirrors in the shower and I like them both. My first mirror has a nice little frame and shelf, while the ShaveWell keeps it simple with just the mirror. A big plus is that the ShaveWell is more affordable at only $9.99. 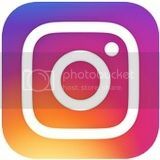 To learn more visit theshavewellcompany.com, you can also find this on Amazon.com. This would be for me, I already have a shower mirror, but if fogs up. This would be for myself, I already have a shower mirror, but it fogs up. this would be for my husband for father's day. This would be for a family member! This would be for my husband and 3 sons. This fog free shower mirror would be for no other than my husband. So hard sharing one bathroom lol. My husband and I could really use this. He likes to shave in the shower and I like to see where on my face I'm using my exfoliating scrub. This would be for my husband and I. He likes to shave in the shower and I like to see where on my face I'm putting my exfoliating scrub. this would be a win for my darling husband. if i won this, i'd be the proud owner of it, for sure. It would be a gift for my boyfriend. It would be for me and my wonderful fiance. I would use the mirror. This would be for my dad. This would definitely be for my hubby, probably as a gift. This would be great for my husband! Thanks! At first, I thought this would be great for my husband but the more I thought about it, I think my youngest son would really love it! This would be a gift for my sweet husband! He's been asking for one! I would put this in hubby's shower! Thank you! I'd give this to my dad for Father's Day. Thanks for the giveaway! I would really like to get this for my husband. 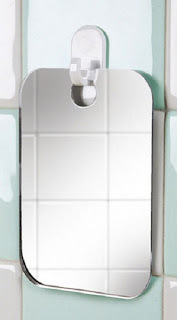 We have a mirror in our shower but it fogs :S and he would love something like this! This would be entirely for me - I need a shower mirror for shaving! This would be for family! My dad could really use one of these! This would be for my hubby.